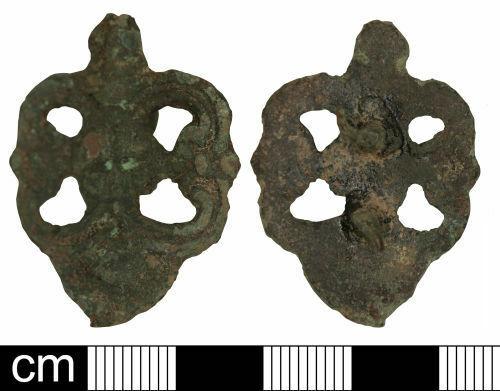 A complete post-Medieval cast copper-alloy mount (c. 1600-c. 1800). The main part of the mount is roughly oval in plan and is composed of a frame, grooved on its upper face. At the centre of the frame there is a heavily worn and corroded anthropomorphic mask surrounded by moulded pellets. Each side of the mask, a fleur-de-lis joins the mask to the frame and forms openwork above and below it. At the top there is a small rounded knop and at the bottom there is a semi-circular feature. This feature has a central raised sub-circular area with radiating grooves and lines below. It probably represents a flower. The object is flat at the rear except for the two integral spikes on the longitudinal centre-line. The mount has been burnt and is heavily corroded. The mount is 33.8mm in length, 25.35mm wide and weighs 5.53 grams. Part of a group of four artefacts found in the same location which had all been burnt.